The 2017 Nissan Titan is a tough truck that gives you capable performance, whether you’ve got light construction jobs or plan on bringing a trailer or boat to for more adventure. The 2017 Truck Trend Pickup Truck of the Year, you’ll quickly understand why drivers of all kinds opt for this rugged truck that offers various off-road abilities. 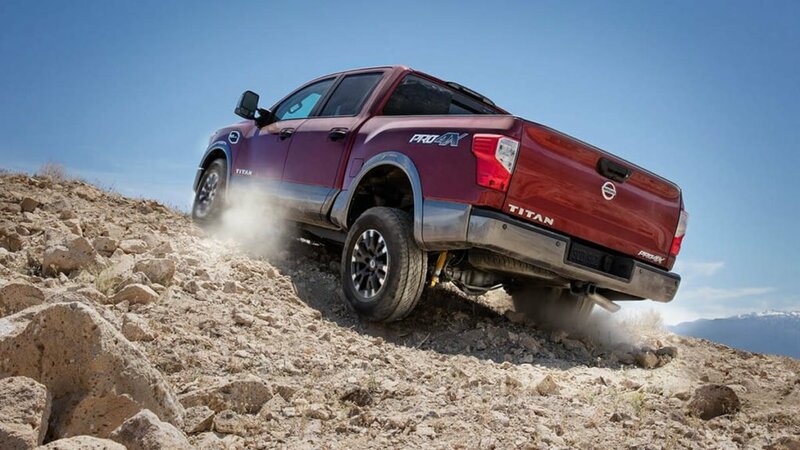 Learn more below, then get behind the wheel of the new Nissan Titan today! When you start the engine of the new Nissan Titan, you’re going to instantly feel that this truck is capable of more than the rest.-The ENDURANCE 5.6L V8 Engine: Producing a powerful 390 hp, this 32-valve engine uses Nissan Direct Injection System and Variable Valve Event and Lift for the right combination of power and efficiency.-Towing Capacity: The V8 engine is capable of hauling up to 9,740 lbs. on the base trim, letting you bring along your favorite big toy for the weekend.-Transmission: Working with the V8 engine is a 7-speed automatic transmission that features Tow/Haul mode for more control when you’ve got a trailer hooked up. The Nissan Titan was designed to help you take on all kinds of terrain with ease, so life has less limits for both work and fun.-Bilstein® Off-Road Shocks: Balance out the bumps in the road and get better clearance with this upgrade available to make this Nissan pickup a lot more fun.-Trailer Sway Control: When you’ve got a large haul to tow, this technology monitors the Titan’s performance as well as the movement of your trailer to make adjustments when necessary.-Remote Engine Start: Get the engine warmed up and ready for the road with the press of a button from your smart key fob. Smart Entry and Push Button Start also make it easier to hit the road. Make an appointment for a test drive of the 2017 Nissan Titan by calling us today at 253-848-4507. We’re located at 101 Valley Ave NW in Puyallup, where you’ll be greeted by our friendly sales specialists. Let us get you a great rate for financing your next truck with our in-house finance department. If you have any questions or feedback, please contact us online!